we are happy to introduce you to our huge selection of chrome-plated permanent air filters as one small branch of available parts for classical British cars. And even better, we can ship 96,3% of all orders the same day. A necessity for the commercial user and a nice to have feature for the DIY guys. SU air filters combine an attractive appearance with reasonable technology. The air filters allow a higher air flow rate and a better operational reliability through manageable technology. SU filters can be dismantled for cleaning. Long-term air filter for SU-H4, SU-HD4 and SU-HS4 carburettors. Round filter with central flange and 45 mm overall height, chrome-plated. Available for all Skinners Union SU carburettors types H / HS / HD / HIF, sizes 2-8. Please click here. Complete air filter for SU-H6, SU-HD6 and SU-HS6 carburettors. Round filter with central flange and 45 mm overall height, chrome-plated with filter element. It's a pity that these beautiful air filters have only matched on a few vehicles so far: Bore too big or too small or engine bonnet does not close or bumps. With the universal base plate made of solid sheet steel, you can mount the filter on all common SU carburettors. The required air inlet opening can be cut in, any size and position. High performance permanent air filter for Weber carburettors. The filters are galvanized, the lids are chrome-plated and polished to a mirror finish. The filter element offers very little resistance to the air flow and can easily be washed out in soapy water if necessary. For Weber 45 DCOE carburettors. Dimensions: 170 x 110 mm, height: 43 mm, chrome plated. Air filter for Weber 40 DCOE carburettor. Dimensions: 170 x 110 mm, height: with 43 mm. Consists of housing and permanent filter element. Round filter with central flange and 25 mm total height. Chrome-plated housing with continuous air filter element. Due to the low overall height perfect for narrow installation situations. Perfect for SU-H6, SU-HD6 and SU-HS6 as well as Zenith Stromberg 175CD carburettor. Round filter with central flange and 25 mm overall height, chrome-plated. Since 1964 K&N builds continuous air filters with low air resistance. Here for SU-H4, SU-HS4 and SU-HIF4 carburettors. Round filter with central flange and 45 mm height. 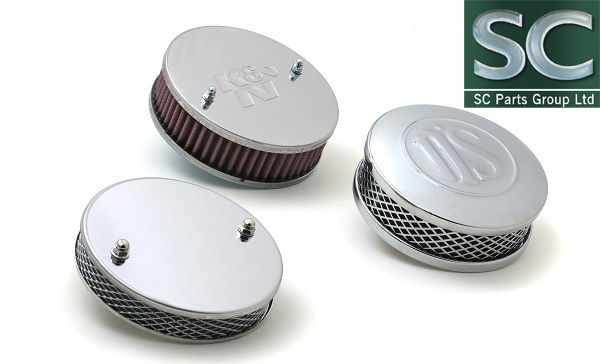 Find all K&N Sport-permanent air filters here. Air filter oil specially developed for K&N cotton filters, 237ml, with extremely long service life. Dye the cotton slightly reddish so that non-wetted areas are easily visible. After washing out the filter, make sure that the filter is not overlubricated, too much oil inhibits the air passage. Follow the maintenance instructions printed on each can. Suitable for all sporty long-term air filters.